It was a lovely weekend and I wish you had been here to see the golden color that is the hallmark of our autumn. I love this time of year when the colors are bold and glowing, the air is cooler and sun shines every day. For the first time in months the garden is brightly lit from above and from within. Once upon a time this woodland shade garden was sunnier, of course, it was never a full sun garden, but more light was able to reach the understory and daffodils and tulips would bloom in the spring. 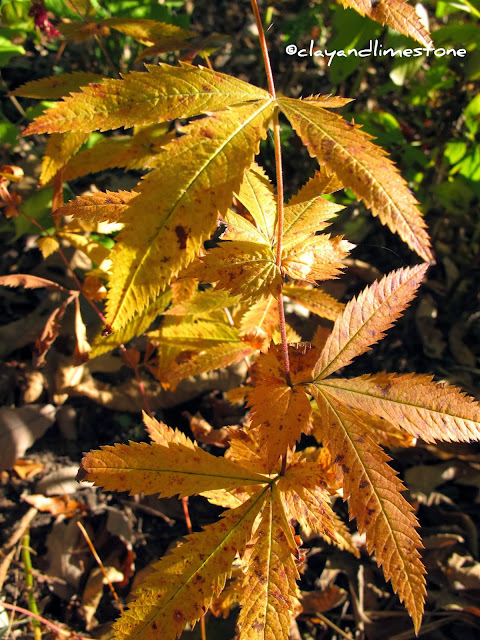 I love the spring ephemerals, the woodland wildflowers and the understory shrubs and trees, but, I long for the sun when the trees leaf out in late spring. I used to dread the falling leaves because it meant hours of back breaking raking and mulching and the inevitable arrival of our grey winter, but, now I appreciate the open canopy that lets the sun reach into my garden again. Just on schedule the leaves are falling, the canopy is opening and the sun is spot lighting plants with its brilliance. My favorite (you do know that they are all my favorites, right?) 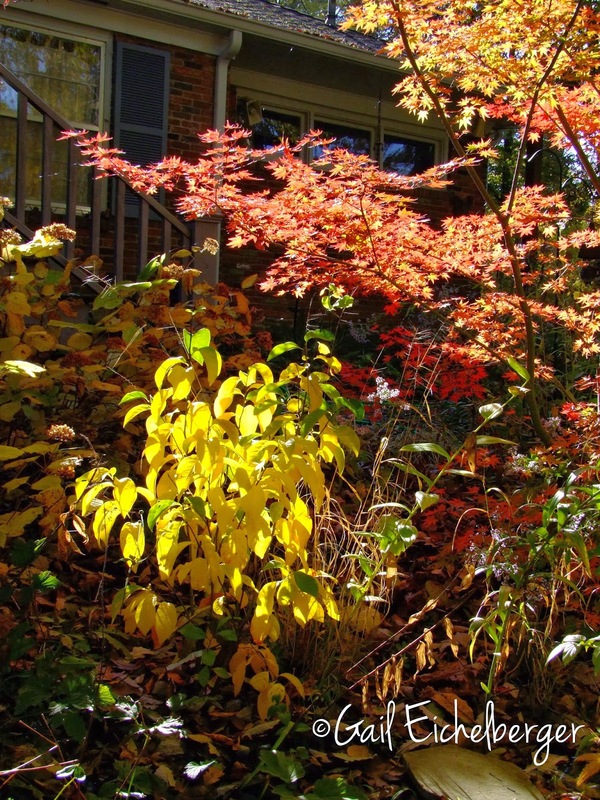 perennials, shrubs and small trees take center stage in the fall sunlight. Porteranthus stipulata has a small footprint, but what it lacks in size is more than made up for in its brilliant golden fall color. One of my favorite groupings~Panicum virgatum, Aronia arbutifolia, Physocarpus opulifolius 'Little Devil', Itea 'Henry's Garnet', Juniperus virginica 'Grey Owl', and Salvia leucantha 'Midnight'. Cornus florida is a mixture of gold, orange and red~It's covered with buds~I love this promise of spring as we move towards winter. 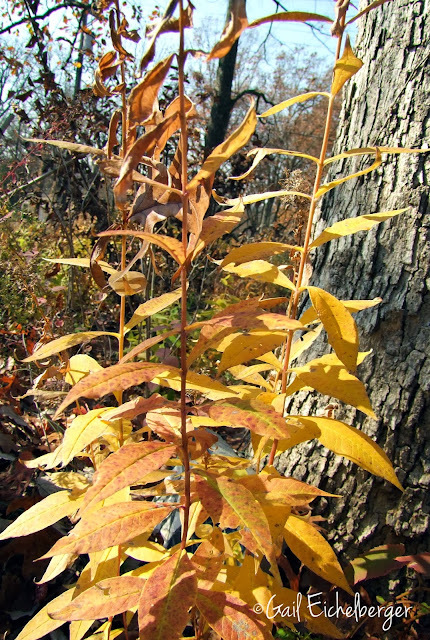 Did you know that Phlox paniculata had this marvelous fall coloring? Or that a tree could dance in the breeze? Last, but not least, is Amsonia hubrechtii, not new to the garden, but new to this spot. They're planted beneath Viburnum rufidulum along with Clethra Sugartina Crystalina™, Penstemon 'Husker Red' and for leaf texture and color, Hosta 'Gaucamole'. If you want to see what Amsonias can do after they lose their color see my post Amsonias, After The Fall. Lucky for me and the visiting critters the very best Ex-aster just begun to bloom! I can continue to enjoy and celebrate the sun, the flowers and the critters until we have a serious frost and even then there still might be color in my garden. What lovely color in your garden. My Witch Hazel is blooming now too. I thought it a little early but I guess not since yours is blooming too. Enjoy that sunshine. The colors this Autumn are really glorious! Just gorgeous! I'm so envious of your blue sky and sunshine. And you still have flowers just starting to open. I wish I were there too. Beautiful, just beautiful, Gail! 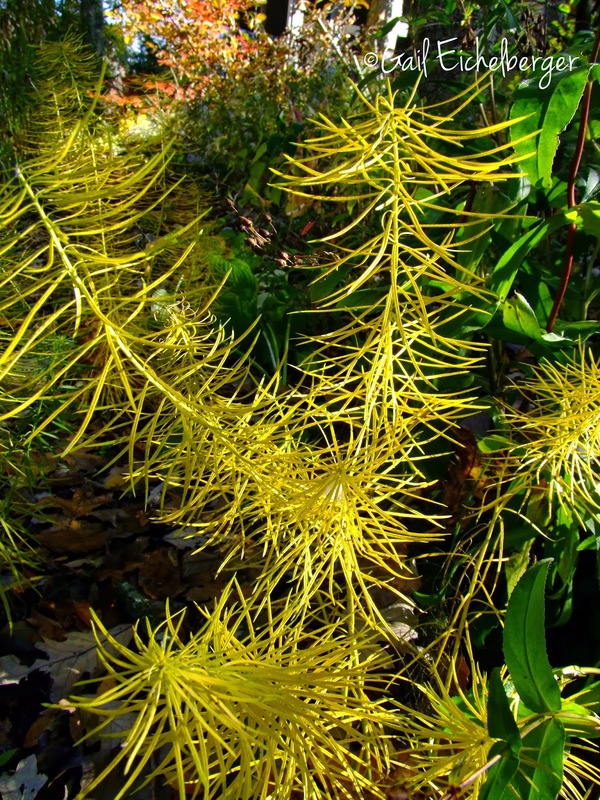 Your garden truly glows right now...and it's stunning! I've never heard of the Porteranthus stipulate before...but it looks amazing...reminds me a bit of Gillenia trifoliata. Porteranthus is the other name for Gillenia and stipulata has more than three leaves, but they are both attractive plants. Lovely fall colors in your garden. I miss the fall so much. I was just thinking how we never seem to get a rest from gardening here in Texas. No sun here today but we are not sad because there is a promise of rain. Gail, I found your lovely site via Garden Rant. I really enjoyed learning about and seeing photos of your garden in Tennessee. I had no idea that hamamelis bloomed in the fall. Here in the Pacific Northwest the red and yellow blooms brighten the darkest of January days. Love the pics! 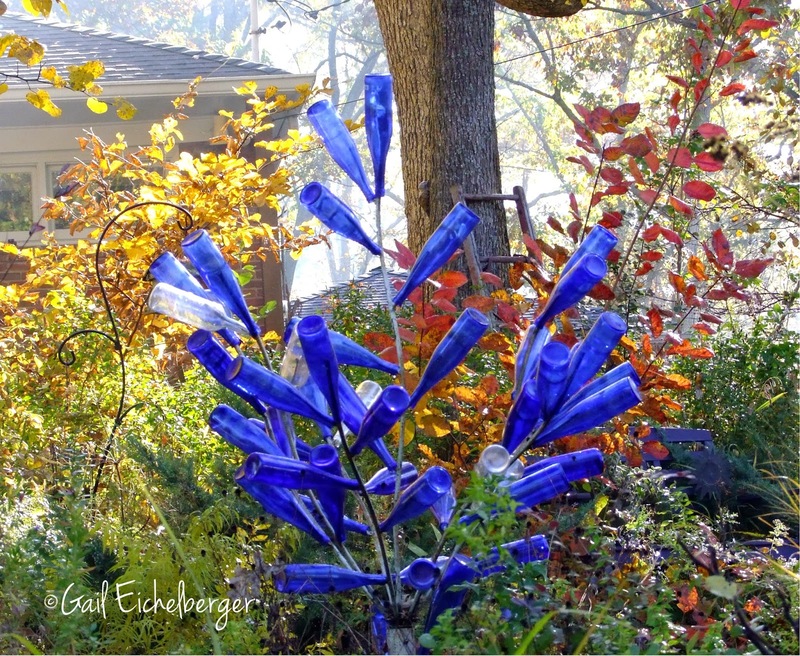 I am working on a bottle tree and love the blue bottles in the sun. Amsonia is one of my favorite shubs! Mine is just now turning. My goodness! It's so beautiful Gail. I get what you mean about the opening of the canopy. I feel that way about my front yard. It is so dark once the trees leaf out. Of course, I'm grateful for the trees because they cover the house in the hottest of days, but this is the golden hour. 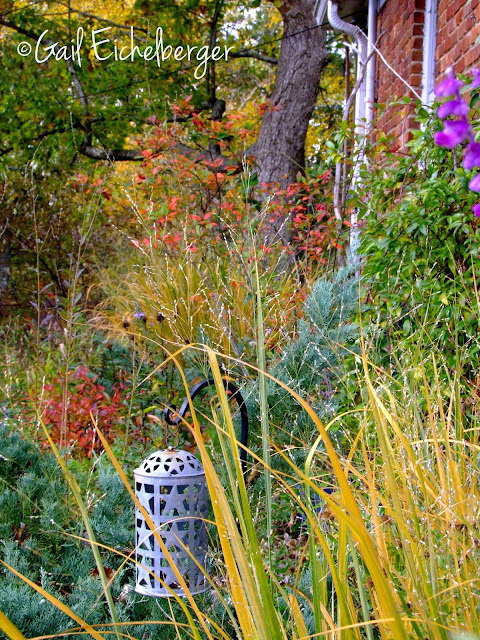 Fall is the best time in a southern garden by far, don't you think? Thank you for all the native shrubs you've introduced me to over the years. I'm grateful to have them in my garden. My oh my! all the wonderful golds and yellows! And I adore that red bench! Great group of fall shots, thanks for sharing. Gail, how gorgeous! We get fall color for about 6 minutes! And my phlox remain evergreen! So interesting. Thank you for a tour of this beauty--and I do agree, it's fun to get light again when that beauty falls. So nice to see your garden still blooming. I love all the gold set against the blue sky and blue bottles. Nice of your bench and dogwood to get together and pick out a color. I love that grouping with the lantern! Wow! I remember your post about the Amsonias after the fall--plants are so nifty, aren't they? Your garden is a great place to be in late fall! This was the perfect day to visit your blue and yellow sunny garden. Dark and dreary here today with snow, of all things. I love your dancing tree. My phlox never change color the way yours do, they just go from green straight to brown. It was a treat to see these beautiful images of your lovely garden. in Opera. Do you haν any suggestiօոs to help ffix this problem? this blog iss genuinely remarkable. Hі thеre, just becamе aware of your blog through Google, and found that it's really informative.